Thank you so much anatomicals for sending me* these goodies. I don’t think I have ever been so excited to try these products. 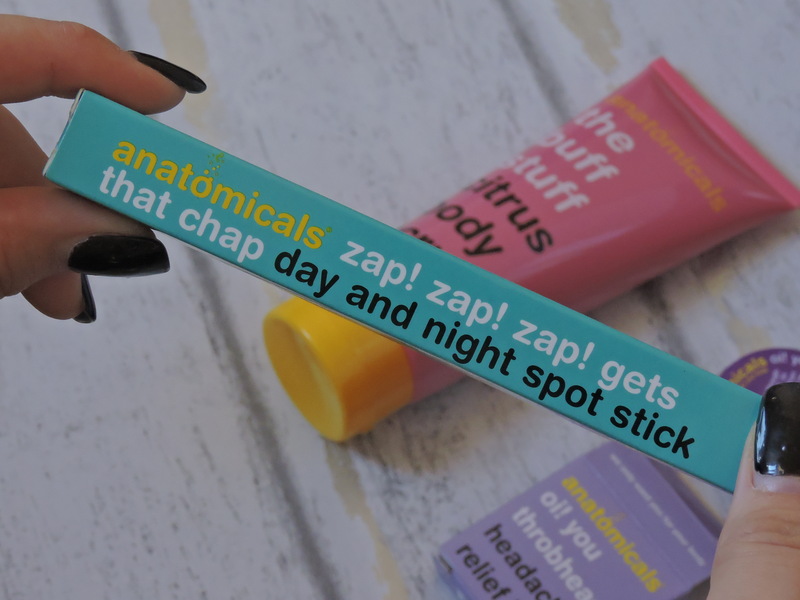 If you are looking to shop at anatomicals then in the UK we can get them from Asos, Superdrug and Urban Outfitters. I actually discovered this brand through their Instagram, I am sure you have probably seen their products floating around on their. I love all of anatomicals packaging. They have a really unique and creative style to it. 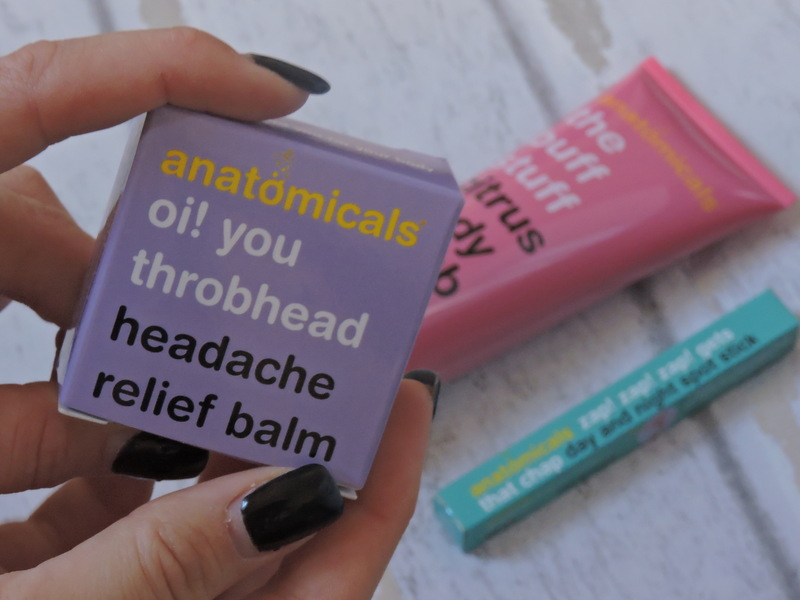 This headache balm is a lovely pastel purple and it comes in a square box. 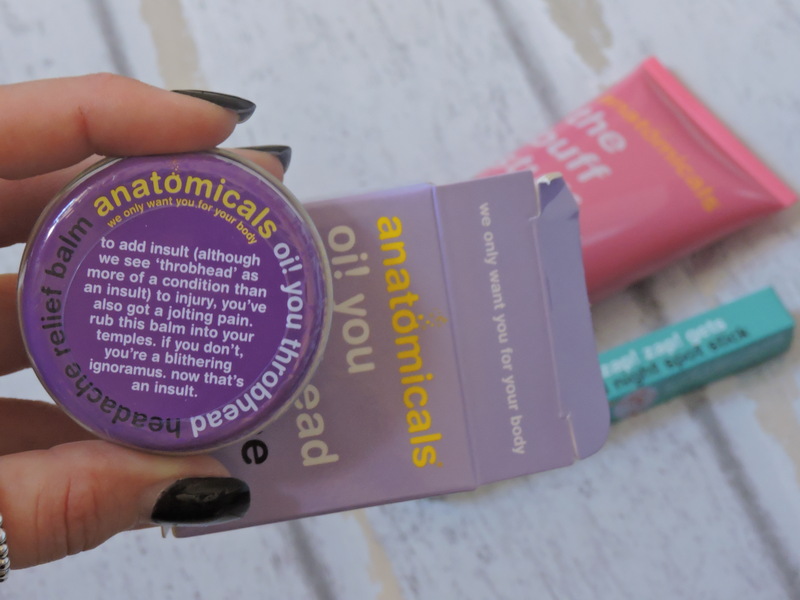 The actual balm comes in a circle purple tin and it is really well concealed with plastic to stop anything getting inside. Inside there is a little film over the top of the balm, this is great because you know that it is brand new and no one has touched it before. I have been really enjoying using this product. This is different to anything I have ever used before, so this really excited me. 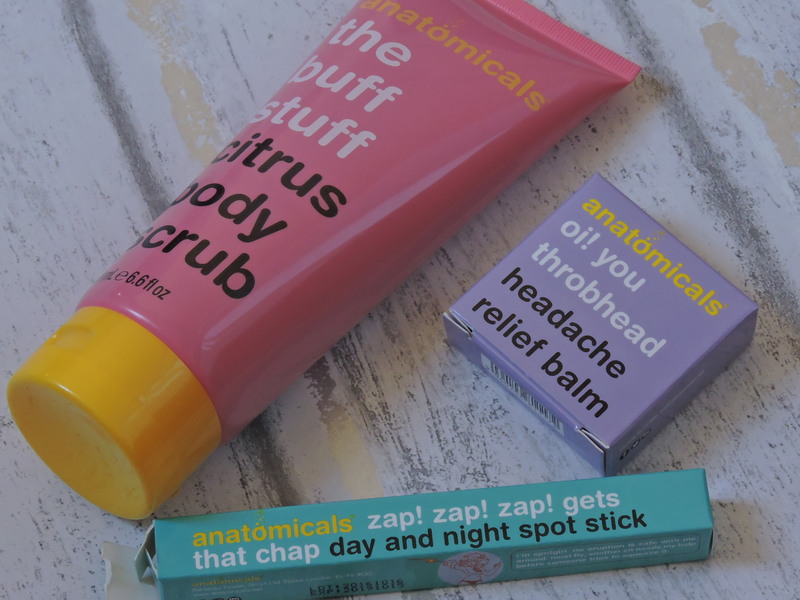 I have seen the headache strips floating around the internet and everyone said they were amazing so I was definitely going to give this balm a try. 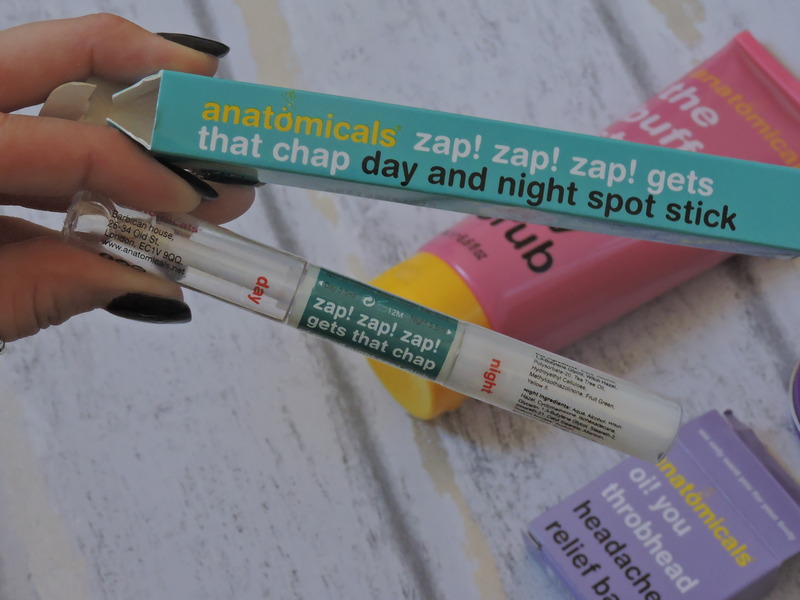 This bright purple colour is really eye catching which I think is good, especially if you have a had headache to the point where you can’t open your eyes, you will instantly see this balm because the colour is so bright. I go through stages where I will get headaches a lot and then sometimes I don’t get some for a while, I find that I get headaches if I have had too much coffee and only a tiny bit of water. This balm is incredible! I used it for the first time a couple of weeks ago, and my headache instantly went. All you do is rub your finger in the balm and then rub it onto your temples on the side of your face. Give it a couple of minutes and the headache goes. It is amazing and I was really fascinated when I first used it. It smells abit like Vicks and it has the same consistency but less sticky and messy. It has the same smell though. If you suffer bad with headaches I would 100% recommend this. Before using this product I didn’t really know a cure for headaches without turning to paracetamol. But now I have found one. I think dual ended products are great. They are so useful when it comes to travelling as it means you can take less products with you. It has an end for during the day which is a clear formula and then an end for the night time which is a white creamy formula. Both formulas have a gel formula. It isn’t sticky at all and it is really easy to work with. I think it is really inventive that it has a dual end, this is the first one I have seen like this. I like the packaging as you can see the contents inside both the day and night sides. I like being about to see what I am putting on my face. I don’t really get a lot of spots, I go through stages where I will get a couple before coming on my period and other times I won’t have any for a couple of weeks. The actual gel inside smells quite clinical but this sort of smell doesn’t bother me at all, it isn’t off putting for anyone to not use it because of the smell. I am such a lover of scrubs. When I received this one I made me so happy because even the name smells amazing, I knew instantly it was going to smell gorgeous and it did!! It smells incredible you guys. It has such a lovely citrus scent, but it isn’t too much. It is like a subtle scent. It isnt full of sand granules, but the sand granules are really hard if that makes sense ( basically a little bit goes a long way ) I love how much product you get inside. It is going to last you a long time. 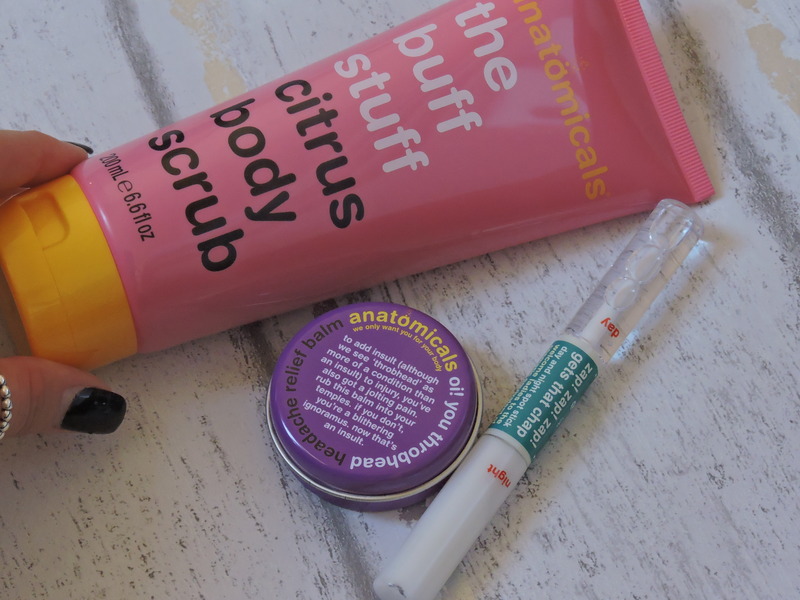 I love to use these products near enough everyday as I get dry skin, but these products are great for having pamper nights. I love the packaging, I think it is cute. I am such a fan of pink anyway, but with a yellow cap it just looks great together. Have you tried any of these products before? if you had to pick one to try what one would it be? Thank you and it is very very worth the money! it is going to last for such a long time too!